UNION THUG TELLS WISCONSIN GOVERNOR HE’LL CUT OFF HIS HEAD…….. – The Tundra Tabloids……. 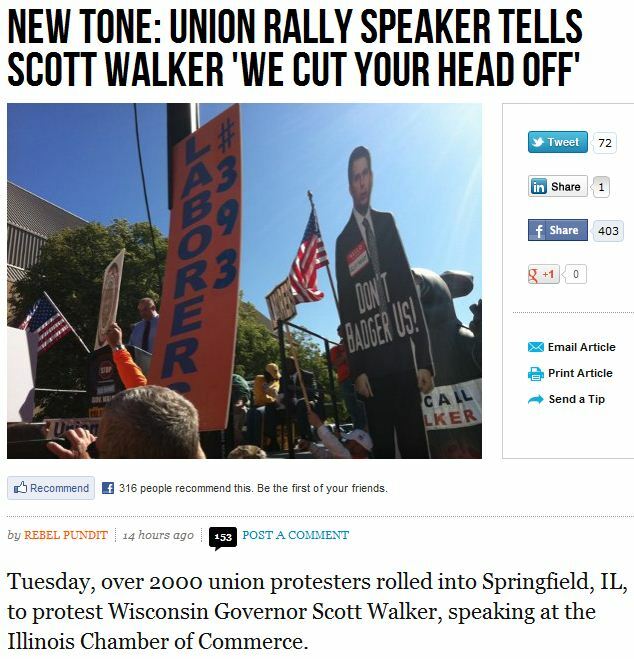 UNION THUG TELLS WISCONSIN GOVERNOR HE’LL CUT OFF HIS HEAD…….. The amount of times this kind of talk was ever heard from a Tea Party speaker…zero. These people (Democrat supporters) are completely unhinged. A word of advice to my conservative friends: It’s not going to be enough to turn the tide by just winning a few elections, the GOP, if it ever wants to remain relevant, has to embrace conservatism, meaning being able verbalize what it means to live in a free society founded as a republic with a magnificant constitution, the glories of free market capitalism and the importance of individual responsibility and get that message to those yet unaffected by the rabble-rousers. NOTE: To my friends who call themselves Independents or even Democrats, wake up and smell the coffee. We are the Davids … and you may be a big giant, a big goliath, but David had 5 smooth stones that brought Goliath down … all he had was stones and a sling shot, and I just wonder out there among us, how many of you came with your sling today? … Load your slings up today when we leave here, putting a smooth stone of equal rights at the collective bargaining table and throw it at Goliath … And Goliath will come down, Scott Walker we send you back to Wisconsin as David did Goliath, we cut your head off and go back into town, singing a new song! Previous Post Previous Post FORMER OBAMA ADVISER MARXIST VAN JONES LIES AND TWISTS THE FACTS ONCE AGAIN……..
Next Post Next Post BIGOTED OIC ANNOUNCES LAUNCH OF NEW MEDIA WATCHDOG, THEIR NEED TO REINFORCE BRAINWASHING COULDN’T BE GREATER……. Leftists as usual are supporters of totalitarian ideologies. This particular Leftist has learned a little about chopping heads off from Islam. The trouble with the Left, with its sole Marxist idea, is that they believe their Idea is the TRUTH. In the human-political domain, when that Idea is applied, leads inevitably to incompatibility with human society. Human society is far too complex to be molded to any idea. When the policy inevitably fails, the ideologues jump to the conclusion, and fervently believe, that it is not the ideology but the people who are the failures. Thus starts the death camps, labour camps, the Gulags and all the rest, leading to ten times as many horrible and cruel deaths then Hitler’s regime managed. Leftists, socialists, communists are victims of the BIG Idea. Were they not so dangerous, I would ignore them. However, as 20th century has shown , they cannot be ignored.